Most online fliers don't really care about scenery, it is all about in the way the aircraft flies, handles and feels. To a point they are correct, but if the aspects of the way you use and fly an aircraft is not accurately represented in it's correct environment then without that reflection you are seriously missing something else in the dynamics of simulation. Almost all of the early simulators certainly followed this aspect, as scenery or the replication of the real world environment was not back then a high profile item on their feature lists, obviously detailed aircraft were not available either, but if the general view of the land (ground) and sky was represented then the focus was on the flying of the aircraft. Even when I came into X-Plane with v9 nearly nine years ago the scenery mesh was still quite primitive, you accepted it because it was the best it could be at the time, even if the mesh and objects was still basic, airports were a little better but were mostly converted early FlightSim 2004, because they were the only objects that would sorta of convert over to the X-Plane's initial OBJ8 format. If you wanted some sort of a realistic environment what you really needed was a very good if warped sense of imagination, thankfully I was equipped with such a heightened awareness. The idea of X-Plane autogen was to not totally replicate absolutely real world objects, but to sort of create a generalisation of what a urban areas looked like, the plus is that the objects were highly refined and extremely efficient, if a little samey compared to the real world, worse was the fact that the SoCal minority objects severely restricted a worldly view and to a point even se in their own American landscape as well. Secondly is that when X-Plane 10 was released all of those 6 years ago, as then computer power or graphic card power was still quite small anyway and if you had 2K of graphic power you were in the top order of trendsetter of gamers, and even with that title then full maximum object settings were just within your reach and not in to the full capacity you really needed to create a realistic urban world around you. The last aspect of X-Plane10 that made a difference was the extension of the area tiles, from a meager 50nm outward to 100nm or . From any altitude the small tile footprint was dismal in the early X-Plane environs, but the 100nm extension did make even a horizon look plausible, but still and even today some mountainous artifacts can still creep into the visual extreme boundary. The odd thing was that X-Plane11's focus was not on the environmental areas, but in some ways X-Plane11 has had an even more larger impact on the realism factor of X-Plane. PBR (Physical Based Rendering) with reflections and it's better shadow and lighting effects now brought the objects to life, and scenery and mostly airports became a much more real place to work of fly into or out from. Then more autogen objects in the form of Germanic style housing really changed the outlook of areas, as the German feel is more representative of areas not only in Europe (including the UK) but even in Asia, Russia and even Japan than the restrictive American architecture. Other areas have changed significantly as well, mostly in graphic power. In 2018 you should have at least a 4K graphic card, a 6K is better, but in reality a 8K card is now required, with a 11K card as a target soon. The line should level off around 15K of which is still a generation of graphic cards away. the Nvidia GeForce GTX 1080 Ti is the current champion of the best of the best with 11K, but even with this monster installed then you will still not get every setting slider set to maximum, as the killer here is the texture quality. So why the X-Plane history lesson? Well it is important to note that In 2018 a line was crossed, an important line on several points. One was that more European urban (meaning industrial) autogen was added now into the mix (which was covered here) and the American set of the same medium industrial autogen is coming in the 11.30 beta. Also scenery developers finally got the message that using the autogen to your advantage can create a better product, in that if the gaps between the autogen and the custom scenery was reduced it made a huge difference to the overall scenery. That aspect is also covered even in a larger picture in that if you create city sceneries with using the autogen as a major fill around your city central items. It is important to note that to get the full effect now, you do need your object slider set at full maximum, in the past this was really never possible, but autogen efficiency is getting better, but obviously there has to be a trade off, even for me. That comes with dropping down your texture quality slider to "high", and yes you lose a little quality, but not as much as you would expect in this age of high quality textures. But find the balance and you can get a high object count and still have a quality custom scenery and still mostly use or get through with the settings on a 4K graphic card. The current effects of all this is that now X-Plane11 scenery is getting mind bogglingly good, the images created for the reviews shows those aspects on how far X-Plane has really now come. There is no way even a year or so ago you could get the scenario of Florence, Italy or the mega Seattle size sceneries to deliver the sort of full visual impact that they are now delivering, in airports with ShortFinal's KLAX and Nimbus's KORD they are not now islands in the landscape, but part of the landscape in a whole. I have always championed the use of the efficient autogen coupled with custom scenery to get the best visual representation and efficiency out of X-Plane and the current development certainly bears that out, yes I accept the Ortho4XP route is very popular, but expensive with hardware and not very efficient. But to date you can see the effects of just have one artist doing the work, as very good and talented as it is, it is just too slow a progress, ditto the excursion for city landmarks as only a few can be produced for each city, leave landmarks to the custom payware addons and add in more regional autogen for more impact, that fact has now been proven. But I am not denying that in areas the autogen model is still wanting and many blank areas do still show uncomfortably in your eyeline. And in another aspect it also now shows the limitations of the X-Plane autogen spread as being now very severely limiting. Certainly the Seattle scenery made that very obvious, with if you sit at Sea-Tec airport and turn your viewpoint to the Seattle city, then the autogen stops about halfway into the scenery, and from above it shows the spread limitations quite badly, and that is not to get started on the limitations of the traffic/road night lighting. But the x square of adjusting the autogen spread like with the earlier load of mesh tiles maybe more of a backward step at this point than a forward one. But that ultimate of nirvana is now getting extremely close as well. Views of horizon to horizon autogen and full city landmarks will soon create a full vista of reality. Helped by (hopefully) the huge efficiency of the Vulkan/Metal api's and the next generation of computer power, then the doubling of current processing power should get the deed finally done, and all should come together around the time of X-Plane12's release. This is also very prominent in that the Laminar Research road map (hint X-Plane12) will mean a major focus on efficiency, so the biggest changes will be internal and not visual, with all the expanded updates and versions over the last decade, and that is not overall a bad thing, as it is a clearing out of the dated aspects of X-Plane that are holding it back and not allowing the simulator to move forward, and obviously we will lose some very cherished areas, which is very Apple, but we know that the benefits will always highly outweigh the losses. The point is that finally X-Plane is starting a new era in realistic visual simulation, yes there is still a way to go, but finally the blocks are now falling into place, and it has been a very long difficult road to get to this point... but we are getting there. Many new airport payware scenery releases are featuring and including WT3 - WorldTraffic3 ground routes and airport operations as part of the package. The included routes are excellent in a drop in and get instant perfect traffic activity at the airport. These provided routes have a load of advantages, mostly in saving you time in either waiting or generating the said routes and then getting on with this flying business. Get it right and it is an instant high satisfaction rating. But many if most scenery releases with this new feature now being released, is this aspect really not what it really seems at all, and in some ways it is a total backstep to the sceneries benefits. In most cases those so called provided "custom created" ground routes are just a generation of WT3 application, packed up and packaged. And in most cases they are not even tested. The issue really goes far deeper than this. Most developers understand the creation of the ATC ground route system in WED (WorldEDitor), but only on a superficial level. So yes they create the ground routes and what is done is done and expect the routes to be perfect, but the problem is that all traffic applications and certainly in the far more clever and more complex WT3 application, in that it requires the far, far more detailed and correct flow information in taxiway and runway routes, correct stand information (open stand or bay stand), and more so in the state of the stand (correct stand information). I admit is it very complex layout to understand and can take a fair bit of time to configure correctly and yes only a few brave souls have gained this specialised skill, and the very best is Brian Navy or K-Man. And to a point that is the problem. Start up a newly installed scenery with these so called provided custom routes inserted and they either work perfectly or worse horribly in they simply don't. The thing is here you are paying for them to be honestly perfect. But too many sceneries lately have been totally horrible, with traffic aircraft running around in circles, running across the grass, departing right through terminals and the list goes on, in fact they are worse than the generated versions in the first place... the worse issue is the landing connection to the gate or stand. This is actually caused by the stand information not being the correct data wise, but the results are when even an aircraft lands correctly it will simply disappear instead of taxiing off the runway to the gate. That is fine but in over half an hour and all the ground aircraft will have then departed and then with no resupply of arriving aircraft, the airport then empties out to a complete blank or a wasted few. Worse this month was LEAL - Alicante Airport by VirtualDesign3d, followed by KORD - Chicago by Nimbus, and the list this year has been extensively long, and do you yet see any reviews on these pages for the said scenery, no, and that is because the traffic systems just don't work, and if you haven't see a review for a released scenery, you can always guarantee it is always this same issue. Thankfully Brian Navy has fixed up KORD, as he fixed up KSEA and KLAX as well and a mountain of others, so we should send him some nice fat food parcels or slabs of beer. But that does not fix the problem? The thing that really annoys me! is that to get the ground routes checked out for these mistakes is not THAT hard to do. I certainly don't want K-Man overloaded with fixup issues to save us all, but obviously he and a few others could advise on what is wrong the ground routes and where to fix them. Developers think that the scenery highlights are the 3d buildings, great animations and specialised glass and as much clutter as you can fill in there... but if the traffic activity does not work, then for everything else it is a dead airport, or a flat simulation, or worse a lot of wasted purchaser's time in getting it all fixed up to the point that it should have been done in the first place... ground routes and airport activity is the No1 feature of every scenery, not the bottom of the list feature, if the traffic does not work correctly you won't use the scenery, buy another one from the developer or worse just bin it... and worse still I won't review it, because the punters deserve better. It is almost here... 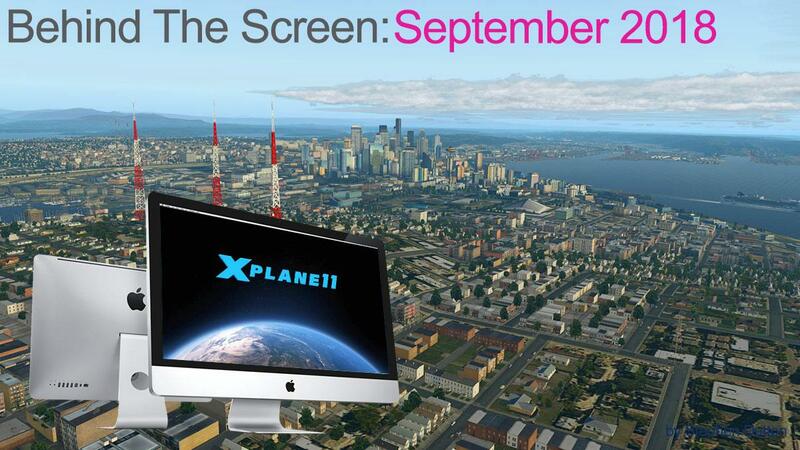 The next X-Plane11 update in beta 11.30 is due imminently, and my guess at the UK Cosford FlightSim on October 6th. A note that the speaker at Cosford for Laminar Research is not Ben Supnik or the Grand Poobah himself in Austin Meyer's but Philipp Ringler. That denotes that Ben is staying back to cover the XP11.30 beta fallout, of which means the release will be the same time as the presentation and not a delayed release date.... excited, you should be. This update is full of features, but it will still be the small fixes that will have the biggest impact on your day to day flying. Obviously it will be the new particle effects that will create the most drama, and the game is on in that who will get their aircraft out first with the effect feature? Or will we get the same deal as when X-Plane11 came out in that many developers will wait until v11.30 goes final before updating? personally I don't think so, as the effects have been in development for a very long time and also they should be be very well tested by now. One thing will be for sure, there will be a lot of updating to do, and it will be very busy until at least the USA Thanksgiving day 2018 marker. The update will of be covered in detail by X-PlaneReviews as per usual, and by the time the next "Behind The Screen" comes around in November then v11.30 will have been released and all the results will be in... so until then, just keep on downloading and updating!